Kids brains develop so quickly through the age of 6. The leaps and bounds that I see in children that take our Kindermusik classes is amazing. We know that they are little sponges at this young age. During those early years, it can be easy to feel that if we don’t cram their little brains with as much experiences as possible that our kids will miss out on developing a key skill. What’s the difference between our Level 1 and Level 2 classes? Many people ask me what the difference is between our Level 1 Kindermusik Class for Young Toddlers (1-2 year olds) and our Level 2 Kindermusik Class for Toddlers (2-3 year olds). The two classes have a similar feel, pace and energy, but there are many differences. Social/Emotional: In our Level 2 Class we work on sharing and taking turns. We may pass an instrument or prop around the singing circle for each child to explore. After their turn, they pass the instrument to the next child. This can be challenging for a 2 year olds, but through our supportive environment, most do well! We do not attempt this in our Level 1 Class. The children are not yet able to comprehend the idea of sharing. It would just end in tears or upset little ones! Large and Small Motor Skills: In our Level 2 Class we add in additional movements into our dances and fingerplays. Children at 2 can often jump, shuffle feet, gallop, and side step so these are now incorporated in our movement activities. They can also do more complex dances with movements at specific times in the song, they can hold hands in a circle dance (teamwork!) and use some imaginative play to move like animals, etc. The 2 year olds can also do more involved fingerplays and remember longer sequences of finger motions. https://mylittleconservatory.com/wp-content/uploads/2018/06/MLC_logo-1.png 0 0 My Little Conservatory https://mylittleconservatory.com/wp-content/uploads/2018/06/MLC_logo-1.png My Little Conservatory2017-09-21 22:46:152018-12-06 06:26:35What's the difference between our Level 1 and Level 2 classes? Do group music classes help kids prepare for school? When parents of toddlers get together and the subject of schools comes up, the question of whether or not your child will be prepared for school inevitably comes up. It’s easy to start worrying if they will be able to read and write in time. But what I know from my experience as an elementary school teacher is that children need to learn how to be ready to learn. We teachers want children in our classes that know how to get along with other children, listen to the teacher, and take turns. We look for these signs of school readiness: self-regulation, listening, social-emotional skills, plus pre-literacy and pre-math skills. One of the best ways to gain these skills is through group music classes. Why? Well, firstly, kids learn these school readiness skills best in an environment with other children. Secondly, they also learn pre-math and pre-literacy through music. Third reason? The learning is all through play – it’s fun! https://mylittleconservatory.com/wp-content/uploads/2018/06/MLC_logo-1.png 0 0 My Little Conservatory https://mylittleconservatory.com/wp-content/uploads/2018/06/MLC_logo-1.png My Little Conservatory2017-09-15 18:38:542018-12-18 21:21:35Do group music classes help kids prepare for school? Babies learn so much when we sing to them! Bonding – When you sing to your baby, they bond with your voice and then with YOU! Singing makes your voice the first and most important voice in her life. Your baby learns that you LOVE her! Transitions – Babies thrive on predictability! It makes them feel safe and nurtured. Adding songs to their transition times (waking up, sleeping, bathing, eating, etc) helps them know what comes next. Your baby will grow in confidence. Language – Language is inherently musical. When you sing, your baby learns about language and communication. Through your singing, baby gains a greater comprehension of our beautiful language. Vocabulary – Songs are full of rich vocabulary. Not only are common, everyday words used, but often songs contain more unexpected words. Songs are full of interesting lyrics, helping to build your little one’s vocabulary. When you hold up a stuffed bear and sing about it, baby learns to associate the name of that toy with the words you sing. Math Skills – The rhythm and steady beat of our songs helps build early math skills. The patterns found in music along with the beat represents the most basic expression of math. Singing names – A baby learns her name by hearing it in songs. If you substitute your little one’s name for other words in songs, they hear their name sung over and over again. Listening skills – Like reading stories, singing is an activity that requires listening. Everyone wants a child that is a good listener! Hearing is something we are born with, but listening is a skill that needs developing. LOVE – Using your singing voice is a way to express love. Your little one doesn’t care if you are a great singer. To them, you have the most beautiful voice in the world. https://mylittleconservatory.com/wp-content/uploads/2018/06/MLC_logo-1.png 0 0 My Little Conservatory https://mylittleconservatory.com/wp-content/uploads/2018/06/MLC_logo-1.png My Little Conservatory2016-08-25 17:10:132018-12-18 21:25:40Babies Learn Through Song! Want to Teach Toddlers Math Skills? Better Get Moving! Early intervention matters in all areas of child development…from speech and language, motor skills, early literacy skills, positive behavior, and more. The sooner a child receives help the greater the impact. As educators, therapists, doctors, and researchers learn more and more how to identify early markers for intervention needs, children at risk for delays receive early intervention strategies, well, earlier. Some of the indicators may seem unrelated at first. For example, new research gives guidance in identifying young children who may need extra mathematical help…all by looking at their motor skills! A Norwegian study shows that two-year-olds with poor motor skills also exhibit poor mathematical skills. Teachers can use this information to identify children who may need extra help. “It is important that teachers of small children are aware of these findings. It will be easier for them to identify children who may be at risk of having difficulties in understanding mathematics. This knowledge can ensure that teachers and staff are quicker to help and support such children with mathematics,” said Associate Professor Elin Reikerås of the Norwegian Reading Centre in a University of Stavanger press release. In the study, the research team evaluated the motor skills of two-year-old children by assessing their abilities to complete jigsaw puzzles, eat with utensils, use scissors, walk around a room without bumping into things, playing on the playground, and throwing and catching balls. Based on their motor skills abilities, the team divided the children into three groups: poor, average, and strong. Then, the team examined various mathematical abilities of the children, such as if the children were able to use their fingers to show how old they were, if they could use the shape sorter box, play picture lotto, sort toys or objects by color or size, demonstrate the difference between big and small through the use of body language or words, and use numerals. Contributed by Lisa Camino Rowell, a freelance writer in the Atlanta area. https://mylittleconservatory.com/wp-content/uploads/2018/06/MLC_logo-1.png 0 0 My Little Conservatory https://mylittleconservatory.com/wp-content/uploads/2018/06/MLC_logo-1.png My Little Conservatory2015-10-22 16:03:242018-12-18 21:36:32Want to Teach Toddlers Math Skills? Better Get Moving! Have you ever wondered: Why do we have a movement component in our music classes? What types of movement experiences should I expect? Young children experience the world through movement. Movement plays an important role in how and what children learn. It is a crucial component to ALL learning at this age. This is why it seems to us adults that the child is constantly moving. 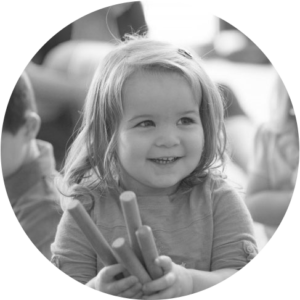 Our classes use circle dances, finger plays, free/expressive dances, imitative movements (ie: moving like a car, train or animal), and much more in every single class. Body Awareness: Labeling, moving, focusing on and controlling specific and isolated body parts as well as the whole body. Spatial Awareness: Fostering an understanding of how our body’s move in space and understanding our personal space. We use important directional words like: around, through, over, under, up, down, inside, outside, behind, next to, to the side, etc. https://mylittleconservatory.com/wp-content/uploads/2018/06/MLC_logo-1.png 0 0 My Little Conservatory https://mylittleconservatory.com/wp-content/uploads/2018/06/MLC_logo-1.png My Little Conservatory2015-08-05 16:01:082018-12-18 21:37:11Why movement? Listening to and identifying sounds is the earliest phonological awareness skill and one of the most important pre-literacy competencies. Without this skill, there will be no progress toward phonics, spelling, or text comprehension. Children become phonologically aware in a specific developmental sequence, beginning with the larger sound units (e.g., tapping each word in a sentence), then focusing on parts of individual words (e.g., blending two words to make a compound word, such as cup-cake), and finally focusing on smaller sound units (/b/-/ig/) within words. This developmental sequence is universal…meaning that children who are English language learners are able to transfer phonological awareness skills from their first language, even when the two languages are very different! And children who speak other alphabetic languages also progress through the same sound-awareness sequence, from larger to smaller units. There is such a thing as training an ear. Parents can extend the application of a listening activity like this one from Kindermusik@Home to pre-literacy by gathering a variety of sound-making materials and playing with different pitches, paces, and lengths of sound. The more experience children gain in learning to identify the subtle nuances between musical timbres and pitches, the more prepared they will be to recognize and identify the distinct sounds within words. Kindermusik@Home activity: “Which Woodwind?” Give young children’s listening skills a workout with this fun, musical game. Kids will learn to identify a piccolo, flute, oboe, bassoon, and bagpipe. This post was written by Minds on Music (the Kindermusik official blog).